Hydraulic Fracturing, also known as hydro-fracking or fracking is the process of extracting natural gas. The technological advancement of fracking makes it possible for the natural gas that lies approximately 7000 feet beneath the earth to become accessible. This process is a combination of vertical and horizontal drilling then fracturing the shale underneath with a perforating gun causing fractures in the shale rocks. Once the drilling process is done, millions of gallons of fresh water mixed with sand and other additives is then injected into the borehole in a highly pressurized manner in order to expand the fissures in the shale layer, allowing gas to escape into the surface. Once the fracking process has been completed, the water, sand and other additives, now with some sediments and oil, called flowback, is pumped backed into the surface. Intensive environmental regulations require the facking flowback to be contained, making sure that this does not permeate into the ground. This flowback is typically stored in frac pits or reservoirs that need to be carefully lined to prevent seepage. 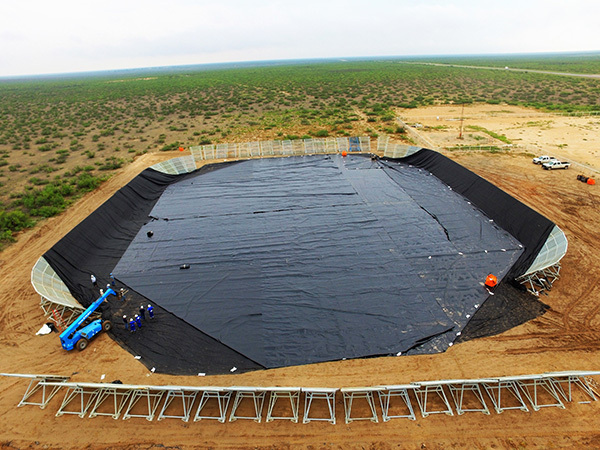 Western Environmental Liner offers a variety of primary frac pit liner materials that help prevent the contaminated flowback from causing any leakage. We offer Reinforced Polypropylene (RPP) at 36 mil and 45 mil thickness. RPP is an excellent product that has a great permeability rating and can withstand the contaminants contained in the flowback. Reinforced Polypropylene, RPP is highly puncture resistant that takes away worries and concerns on any seepage or leaks. RPP has been proven to withstand the extreme temperature of nature. Depending on the thickness, it comes with a limited 15-year or 20-year warranty and can last over what it’s warrantied for. Western Environmental Liner can also provide you our Aqua series of Reinforced Polyethylene (RPE) materials. Our woven coated Reinforced Polyethylene liner comes in various thicknesses, from 12-mil to 30-mil. If a specific thickness is needed, we have the capability of acquiring it for you. RPE is an excellent and practical product that can be used for short-term containment of flowback. Western Environmental Liner understands that flowback is contained in a short amount of time and the frac pads or frac reservoirs are then cleaned up for the next fracking process. Our reinforced polyethylene is the most cost-effective way of containing the flowback and still get the job done. It can withstand the contaminants for the period of time that’s needed. Its high-density polyethylene scrim, coated with low density polyethylene, allows it to have excellent tear-resistance, making it durable and reliable and at the same time protecting it from corrosion and abrasion. Western Environmental Liner has multiple factories located in Tolleson, AZ, Romulus, NY and Great Bend KS. With our over 30 years of experience in the industry, we can guarantee that we will be able to meet your frac pad amd frac pit liner needs in a reasonable short amount of time. The materials that we offer normally come in 12-ft rolls but we can fabricate it to whatever size you need in order to save time and money in the installation process. If you opt to do the installation yourself, we can provide you the tools that you need in order to make it easy and convenient for you. On top of our expert advice, we can provide you hot-air guns or floor welders and how-to manuals and videos to make sure that you get the help that you need. Western Environmental Liner can also do a turnkey installation for you. Western Environmental Liner has been providing its services to some of the biggest turnkey installers in the fracking industry and we will be excited to help you with your frac pit liner needs. If you have any questions, please do not hesitate to contact us via phone, e-mail or through our website and one of our liner specialist will be happy to help you.